Aoi was a quick plan B for a group tour I was leading. 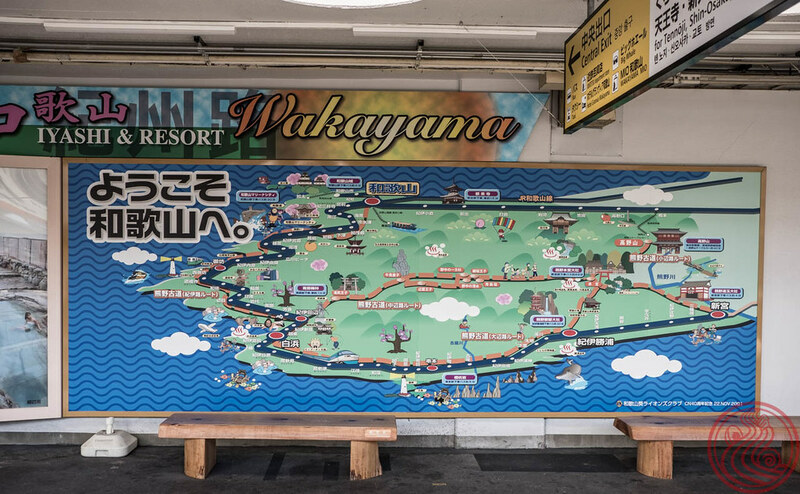 Many of Tokyo's best shops close randomly and without warning, much to the dismay of a tour guide. Thankfully, Aoi was open. Oh, great. The famous 厚切りジェイソン came here. Atsugiri Jason is an American TV talent in Japan. I have a long story about why I hate this guy (nothing personal!). The short version is that I did a TV gig and they kept saying I look like him. At the time I had never heard of him, so the whole gag was a flop. I looked like an idiot in front of Kyari Pamyu Pamyu and Yoshiki from X-Japan. 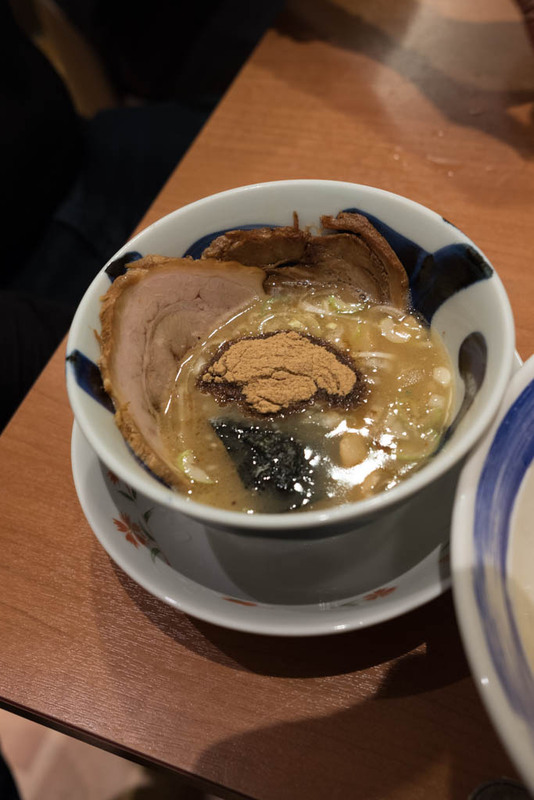 It's a standard tonkotsu gyokai, meaning they cook pork and chicken overnight, and then hit it with plenty of dried fish in the morning. 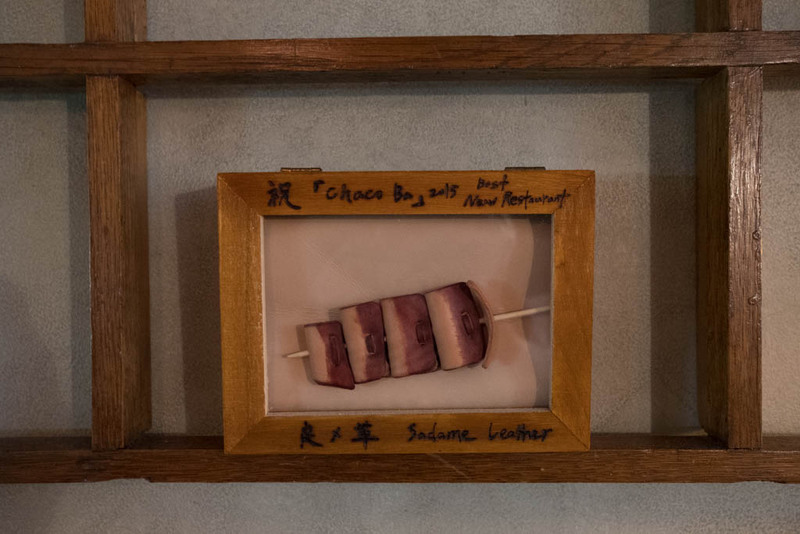 Aoi uses 鰹 (skipjack tuna), サバ (mackerel), and 煮干(dried sardine). Good stuff. I #crushedit for sure this time. 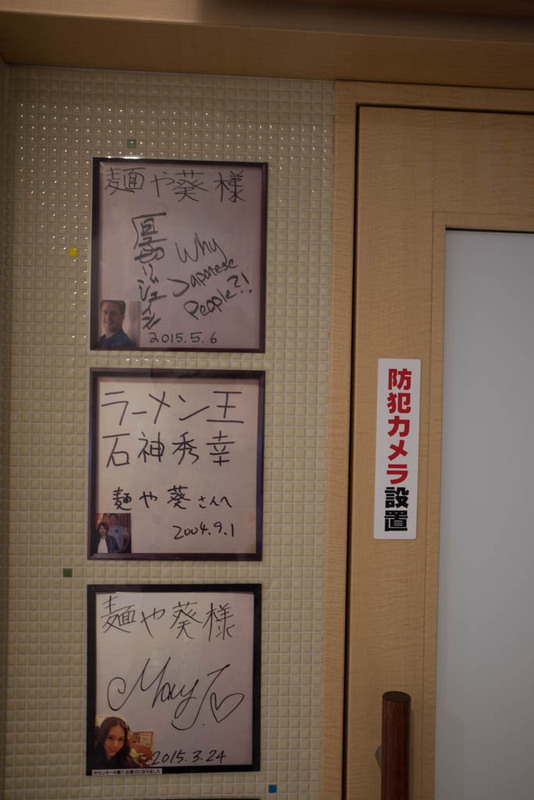 But seeing that autograph on the wall brought back a bitter memory. 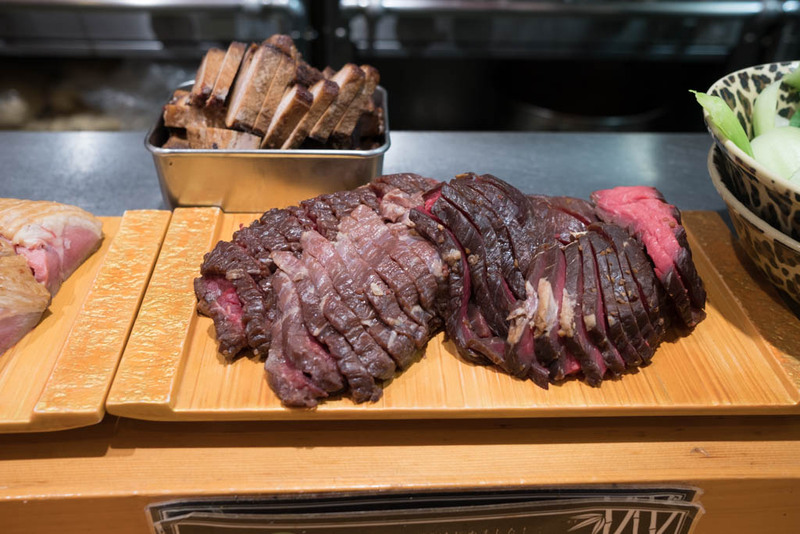 I was here with a local newspaper following me for the day, so I'm not sure if the counter covered with beautiful, sous vide meats was meant to be like this. Regardless, feast your eyes. This place is a bit of a mystery. There is a rock vibe to the whole thing. 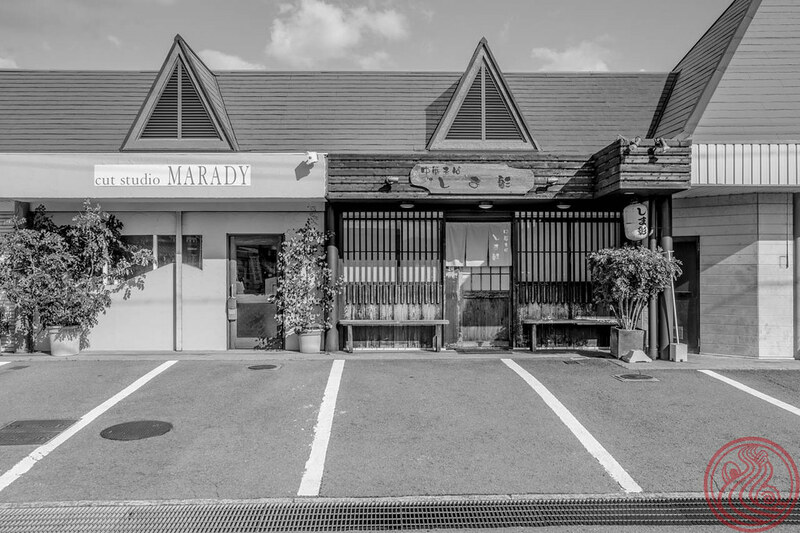 The original shop hails from Tochigi, a prefecture not far to the north of Tokyo. 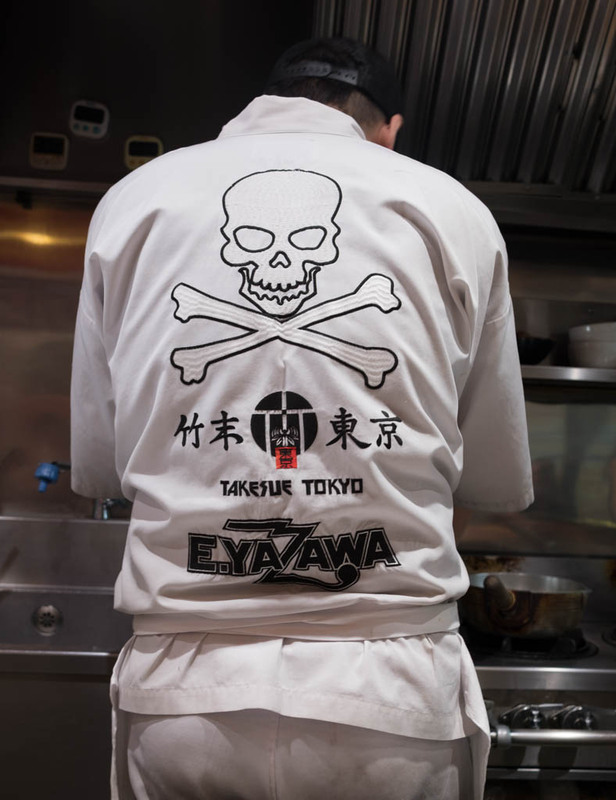 Further research on their website points to Eikichi Yazawa, one of Japan's biggest and baddest rock stars. 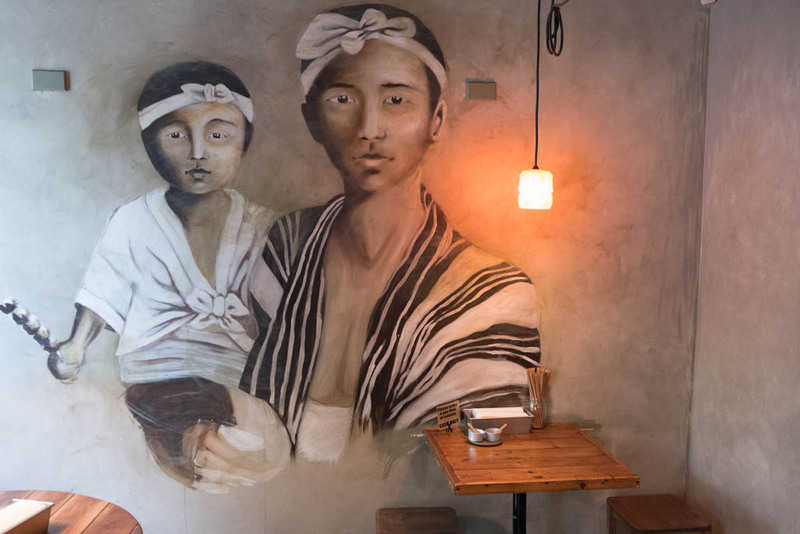 Takesue, and their group of sister shops in Tochigi, are obsessed with the guy, and it is his passion that they seek to mimic with their own. 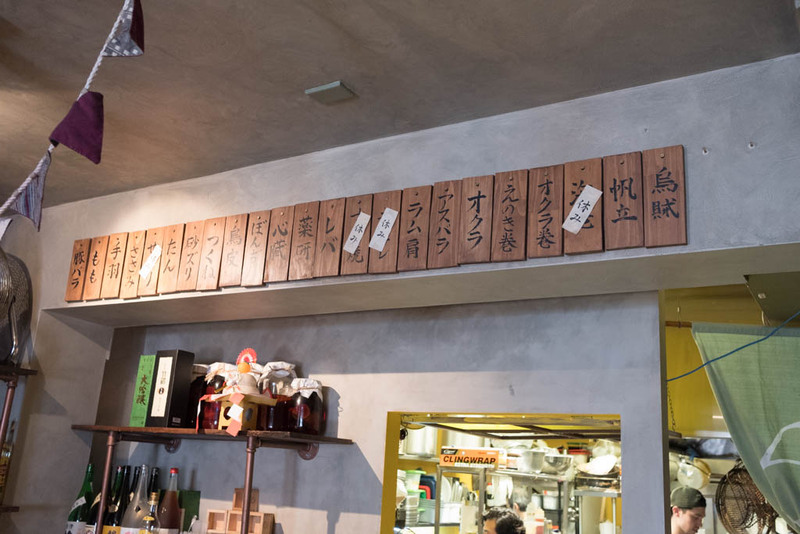 The menu has a shio and a shoyu, but my money is on the more unconventional ヤシオマスの塩そば, a shio ramen made with a kind of Japanese trout, or the 鶏ホタテそば, a chicken and scallop bowl. 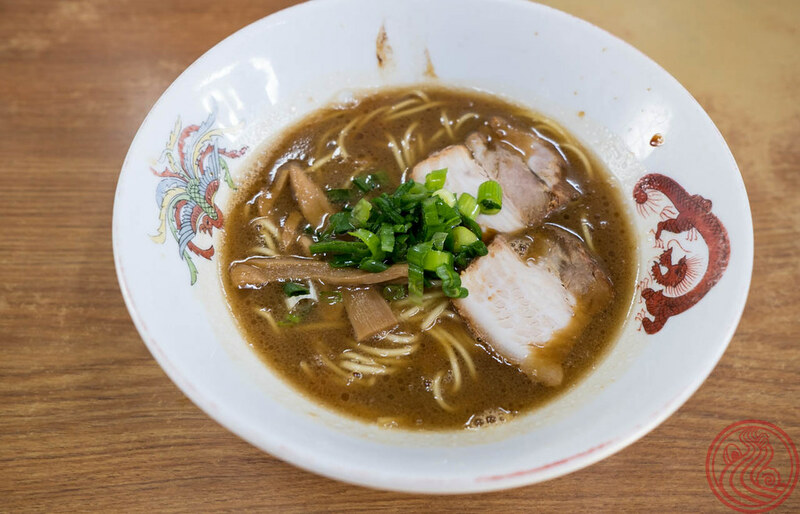 The trout ramen has a creamy, fishy flavor that is similar to salmon. On the fishy side, so be warned. The base soup is mostly made with chicken. 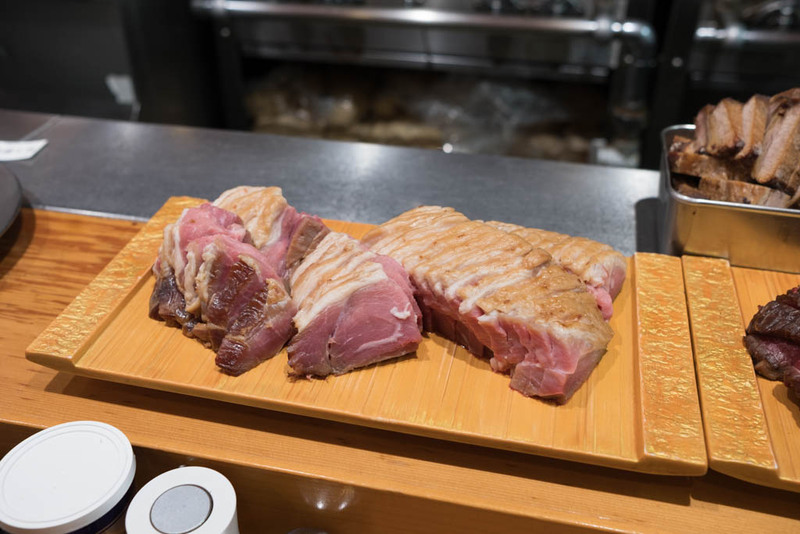 It's a simple base that lets those outrageous slices of pork and beef chashu shine. 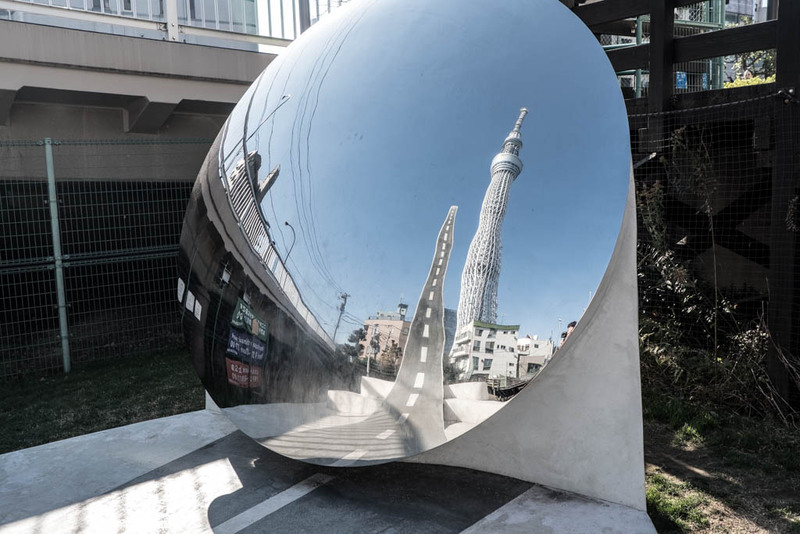 Very near the Tokyo Sky Tree, but enough off the path that it still feels undiscovered. 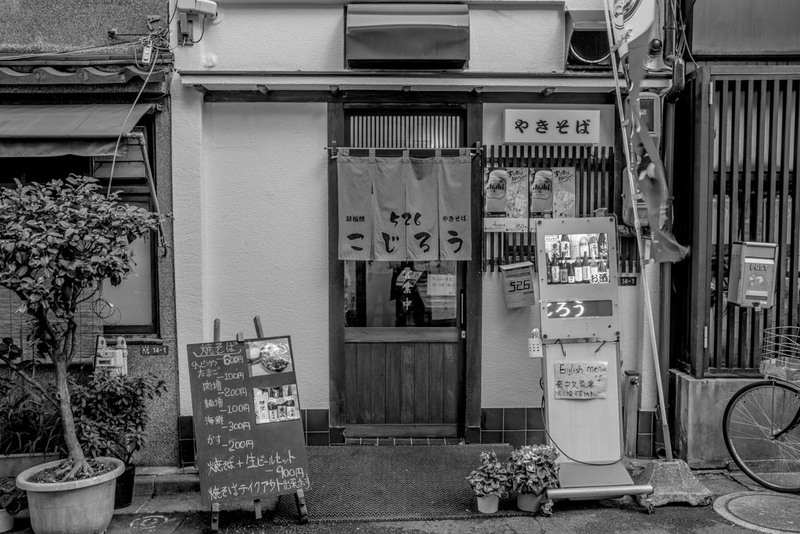 Anytime JIRO appears in the name of a ramen shop, you know what you are in for. Thick, wheaty noodles. Intense soup. Garlic. A possible food coma. 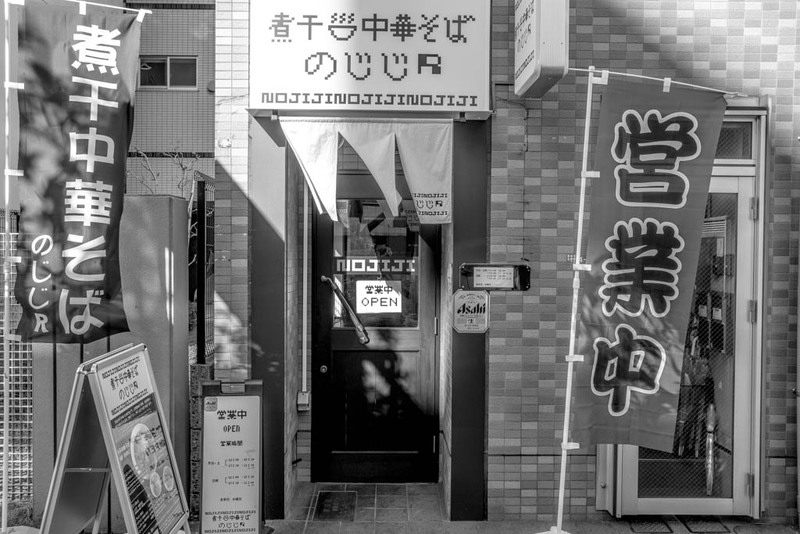 Kojiro 256 in Asakusa is a bit of an outlier, though. 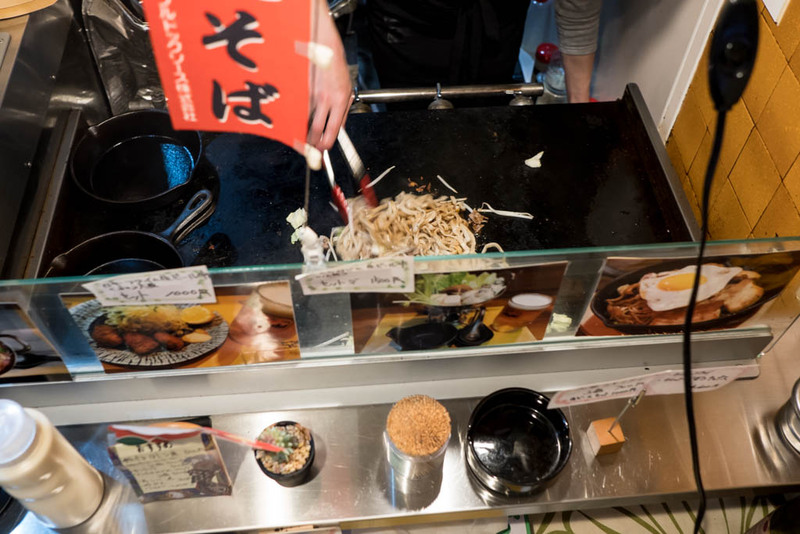 They share the noodles with a Jiro-style shop, but instead of throwing them in soup, they get made into yakisoba. 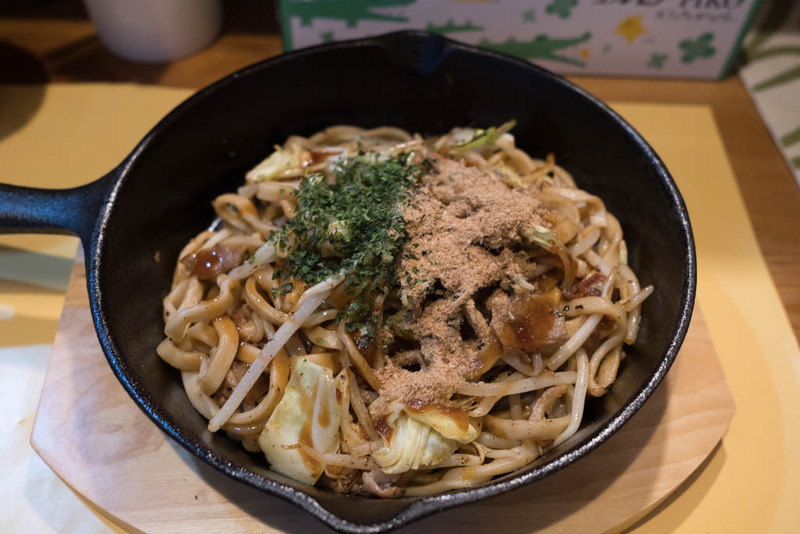 If you don't know the joys of yakisoba, I'll break it down. 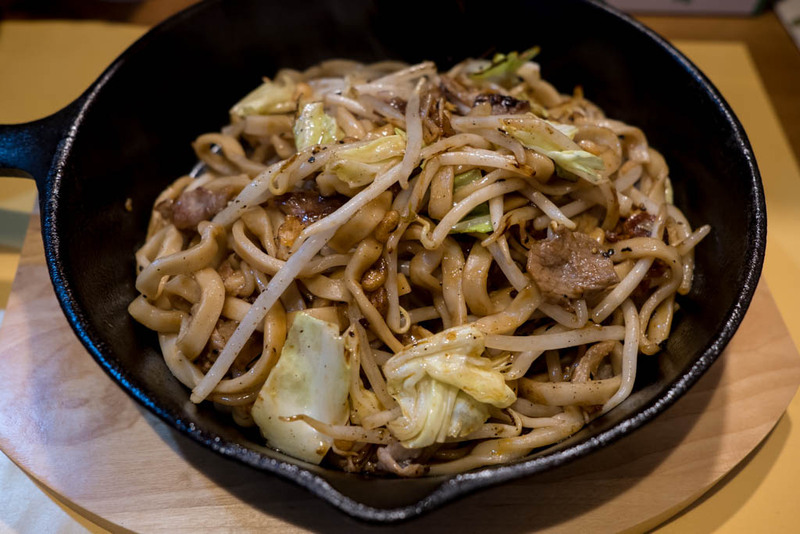 Chinese-style wheat noodles are cooked and then stir-fried with cabbage, bean sprouts, pork, and a Japanese brown sauce. The whole thing is topped with bonito flakes and powdered nori seaweed. You wouldn't be faulted for comparing it to a lo mein or pad thai, though it is a unique dish all together. 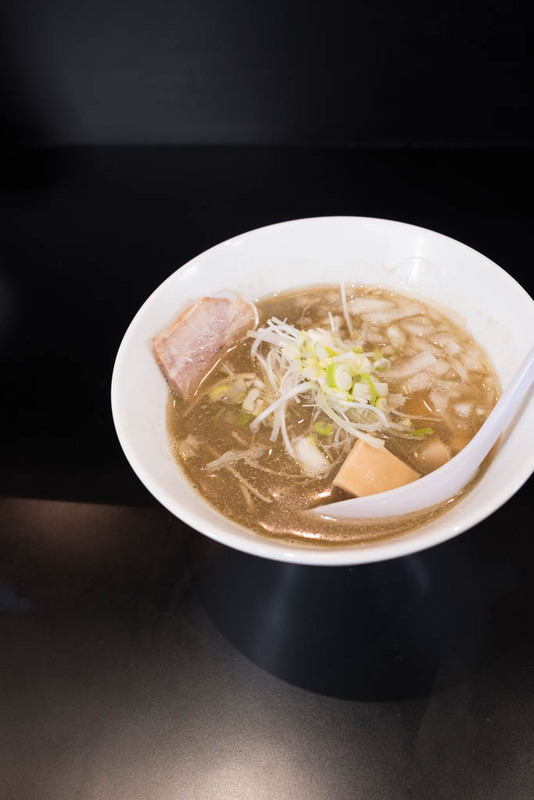 Jiro-style noodles are fat and wheaty, and it turns out excellent to use in this way. Who knew! 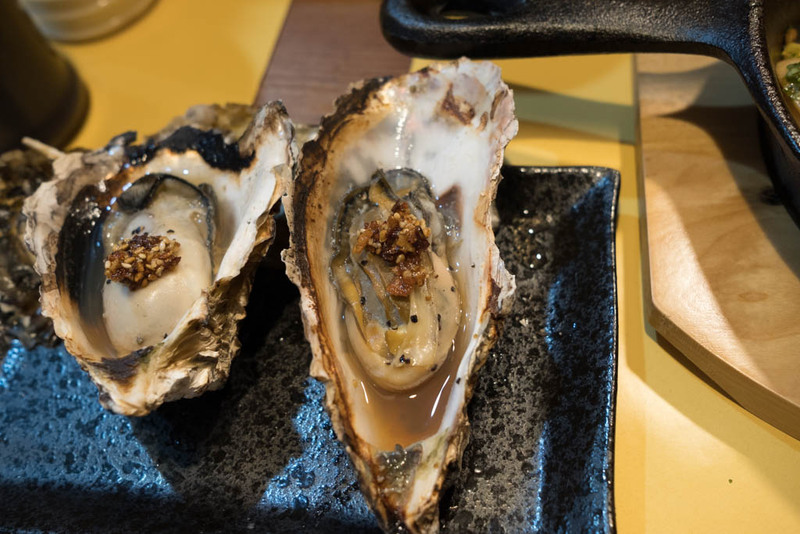 Apart from a few kinds of yakisoba, the grill gets used for oysters and other snacks. Come hungry. 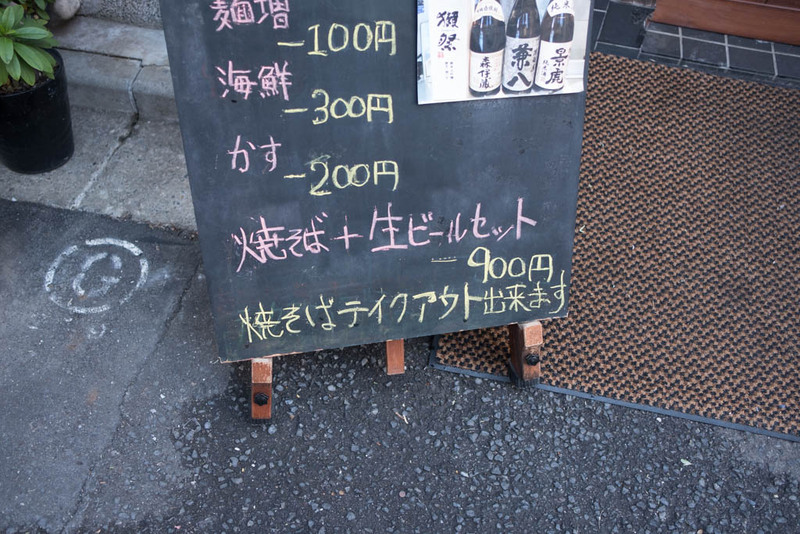 Oh, and 900 yen gets you a set with yakisoba and a draft beer. Video game nerds, I need your help. Does the word nojiji or nojijiR mean anything? 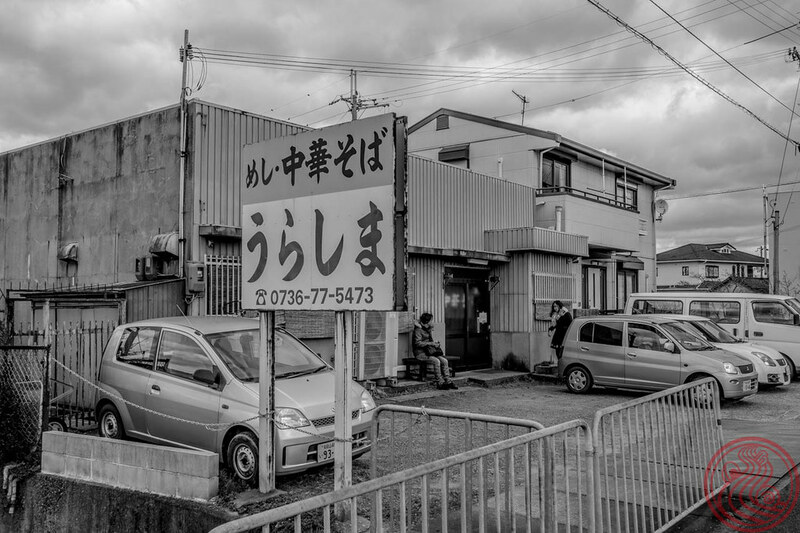 I ask because I stumbled on to this spot one day, and immediately noticed the 8-bit font. 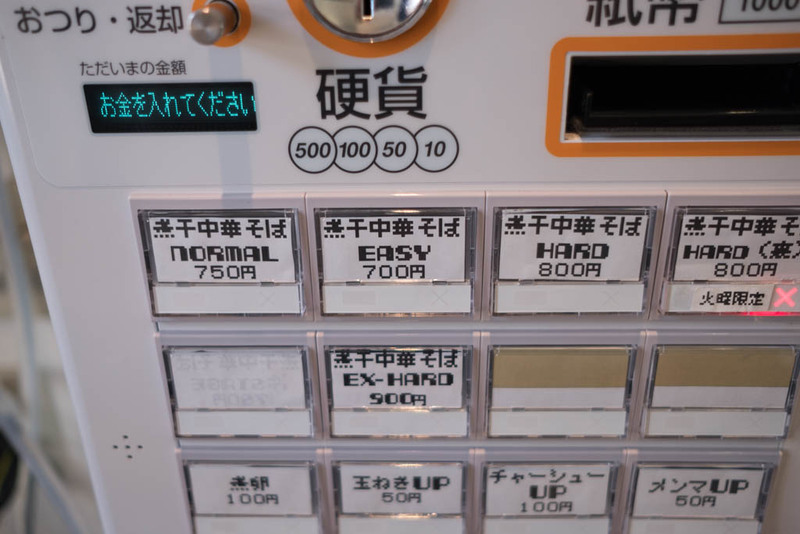 On top of that, the ramen is graded from easy to hard, and there are options for 1UPS. 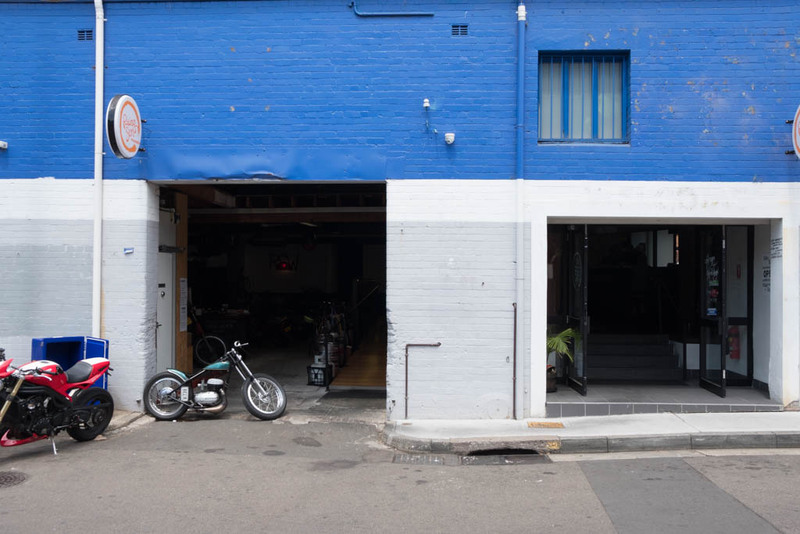 The shop itself is stark white, devoid of any video game memorabilia or collectibles. 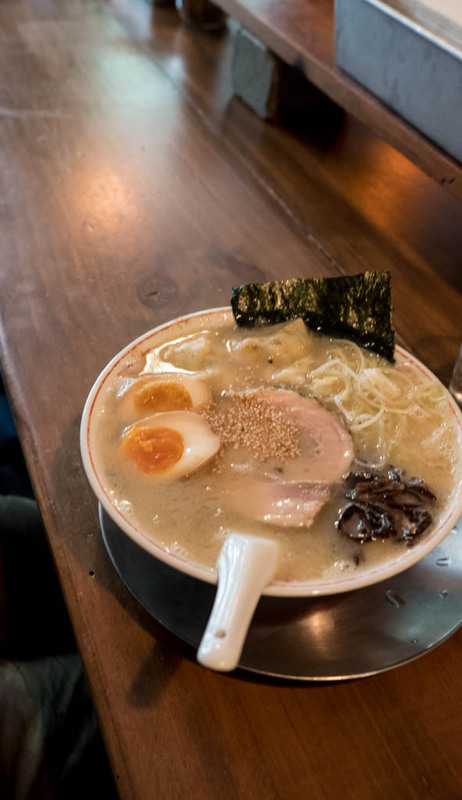 Just the ramen. 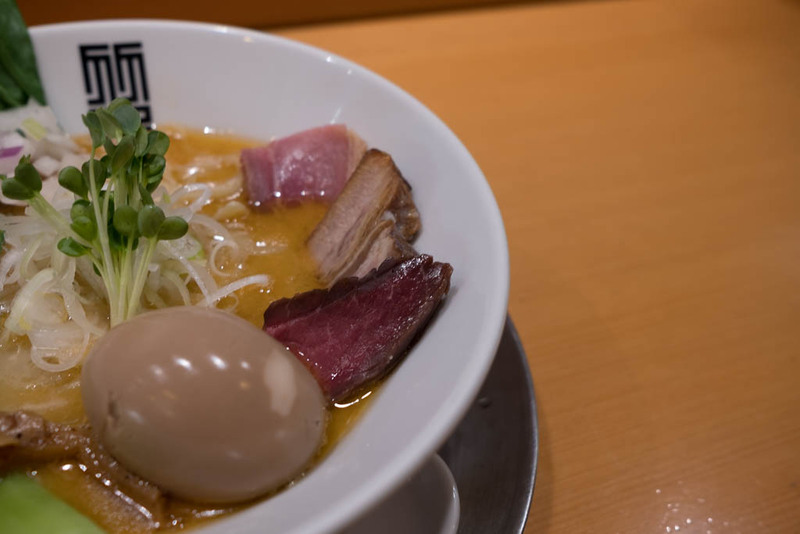 Niboshi ramen. 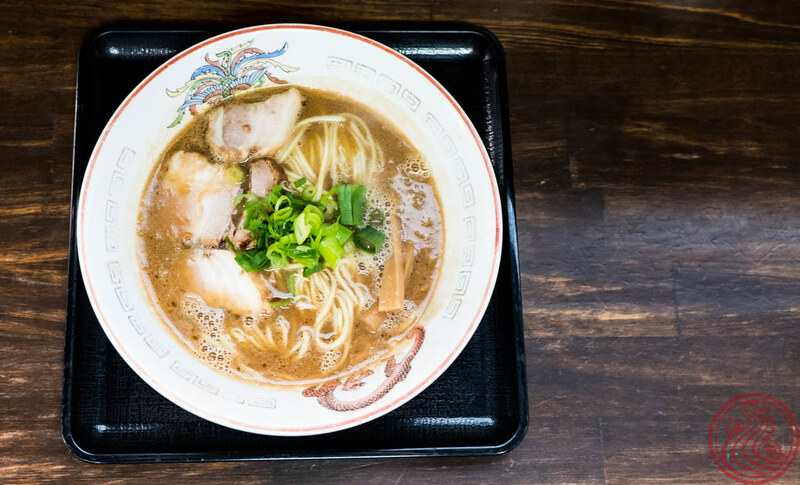 When it comes to a difficulty level, niboshi ramen is the style that is best suited for a challenge. Niboshi, dried baby sardines, are bitter, funky, and amazing. Nojiji R is conveniently located near the Tokyo Sky Tree, so for a tourist who happens to be in the area, this could be a good choice to try this unique style. Personally, I love the stuff, but I've noticed that more and more foreigners are simply not fans. 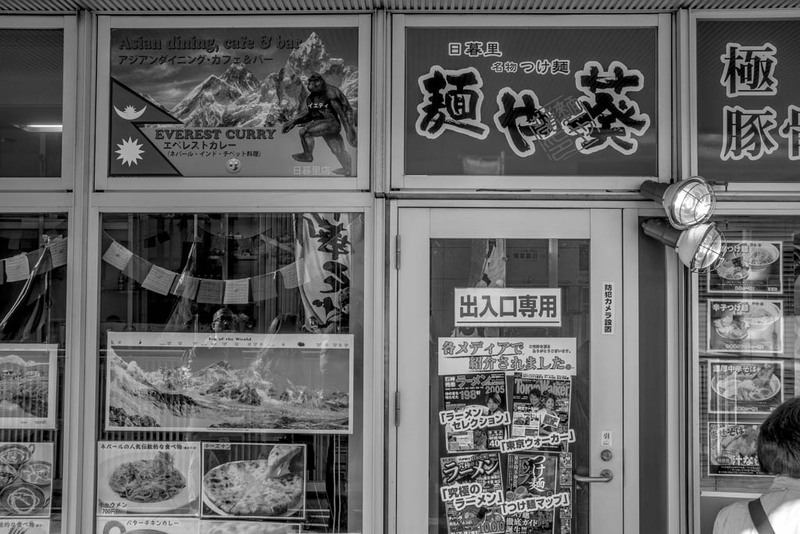 Niboshi ramen overseas, even in other Asian countries, has for the most part been a failure. 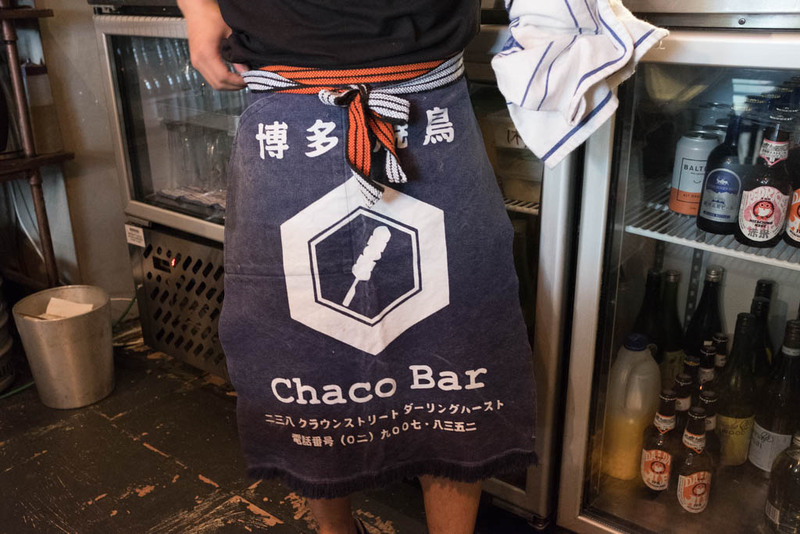 Sydney is no stranger to Japanese food, and Chaco Bar, in the Darlinghurst area, fills the yakitori gap nicely. Or so I've heard. 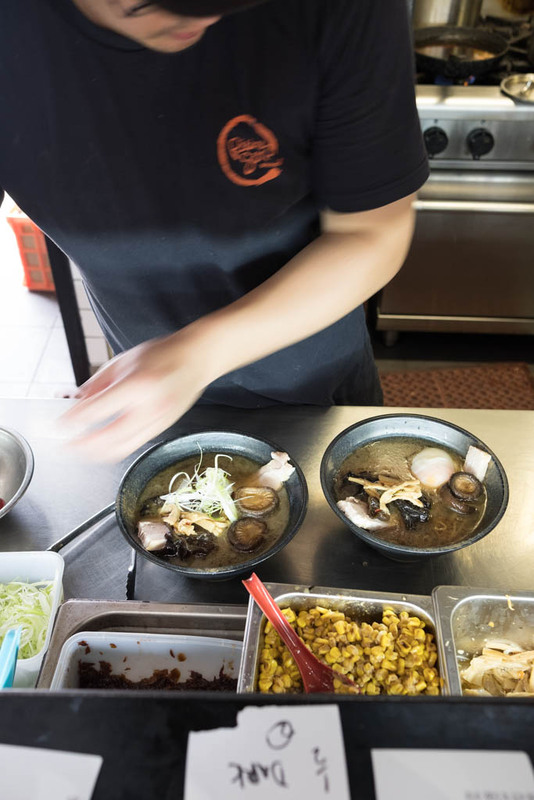 Lucky for the ramen nerds, this yakitori spot serves up a limited number of ramen bowls for lunch Wednesday through Saturday. 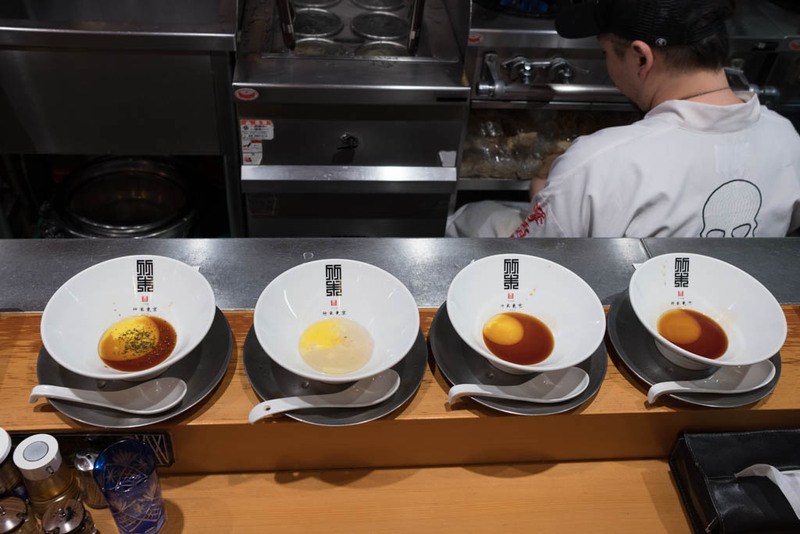 In true Japanese fashion, they offer limited bowls alongside their standard shoyu, shio, scallop, and spicy version. 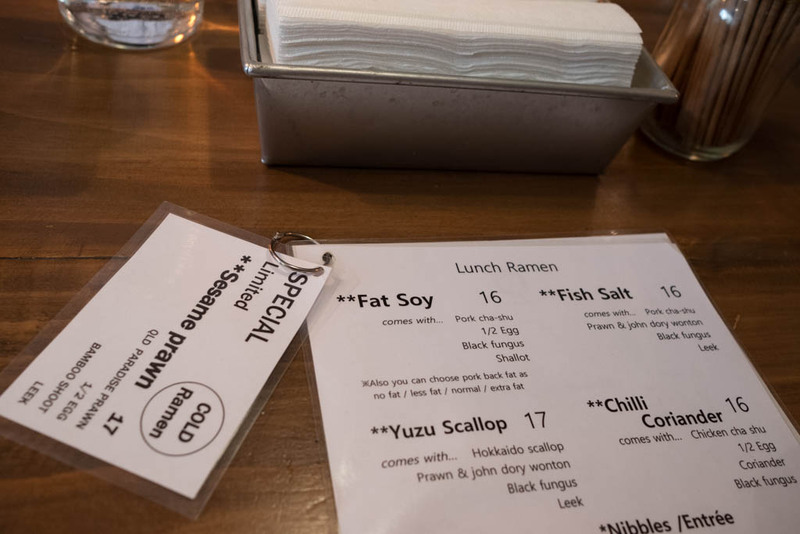 The Fat Soy is named so because of the addition of seabura, pork back fat. I rarely see this stuff outside of Japan, which is a shame. Silky-smooth globs of fat are never a bad thing. Of course, you can get the bowl with less, or even no fat if you like, but who would do that? 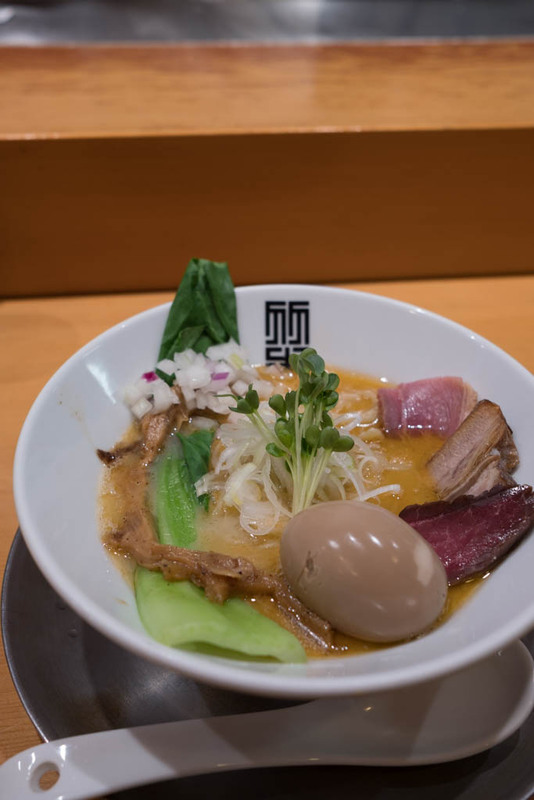 Thick chashu, solid egg. 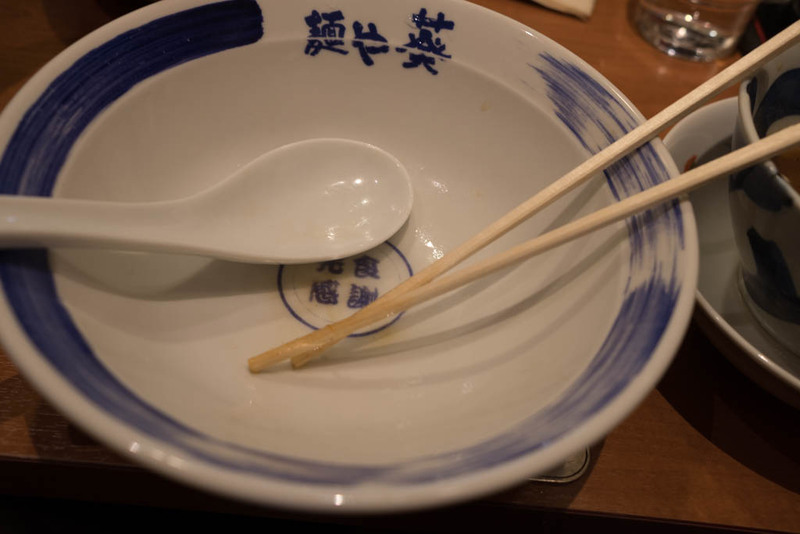 This bowl is pretty much what you'll get at a decent shop in Tokyo. The interior tavern vibe is a bonus. And hello to one of the most off-the-wall, random bowls I've had in my life. 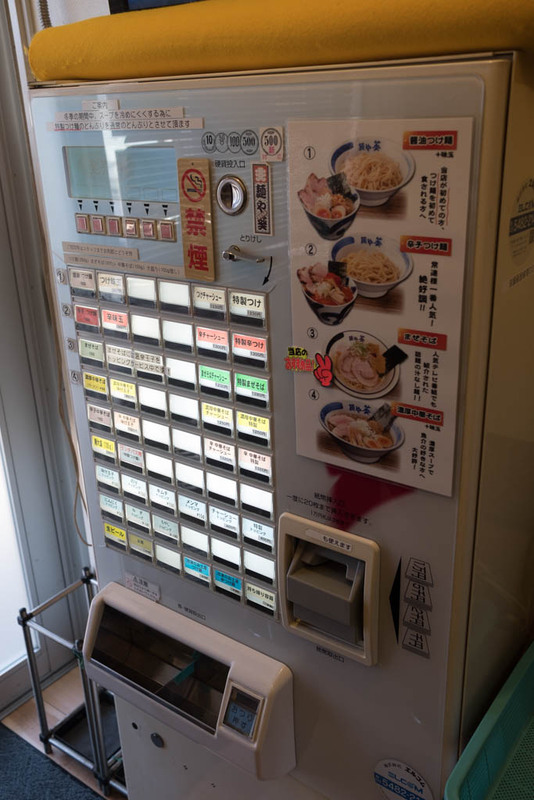 Breakfast ramen in a motorcycle repair shop. 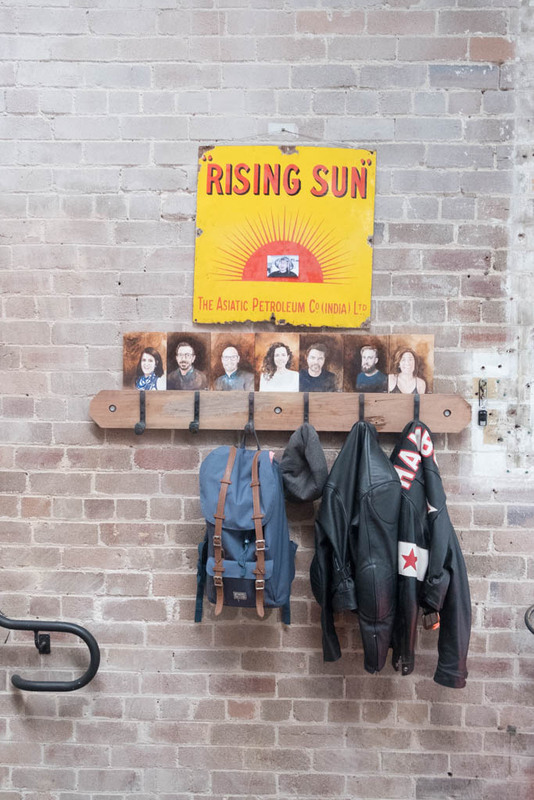 Rising Sun Workshop (RSW) is a a community bike repair shop and cafe. Growing up in America, there was always someone, or someone who knew someone, with access to tools. When I made the move to Japan, I quickly learned that your average Joe doesn't have basic tools, and would have no idea what to do with them anyways. There is an entire business model built around this, with dealers charging insane prices for the most basic of services. A lot of this revolves around the two year shakken (mandatory inspection) life cycle. 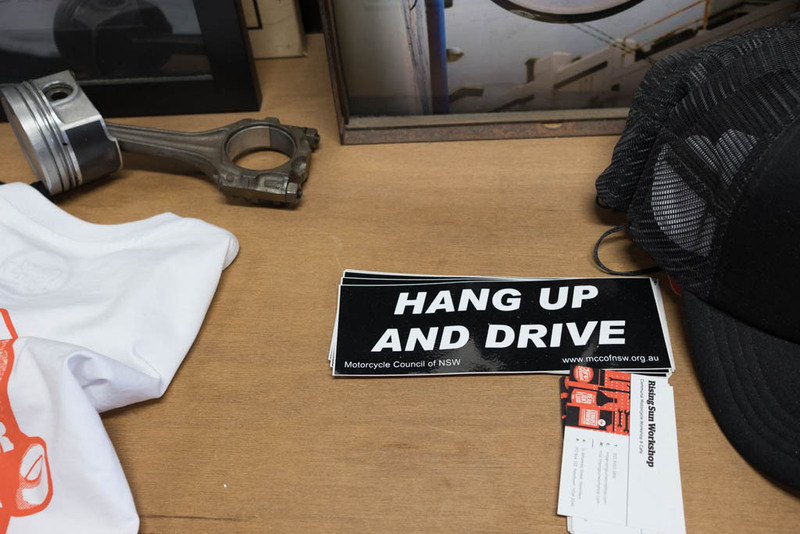 Bring in your vehicle, pay a few thousand dollars, and get it back fully maintained. Doing the repairs and shakken yourself costs around $300. What I'm getting at is that I am in love with this place. 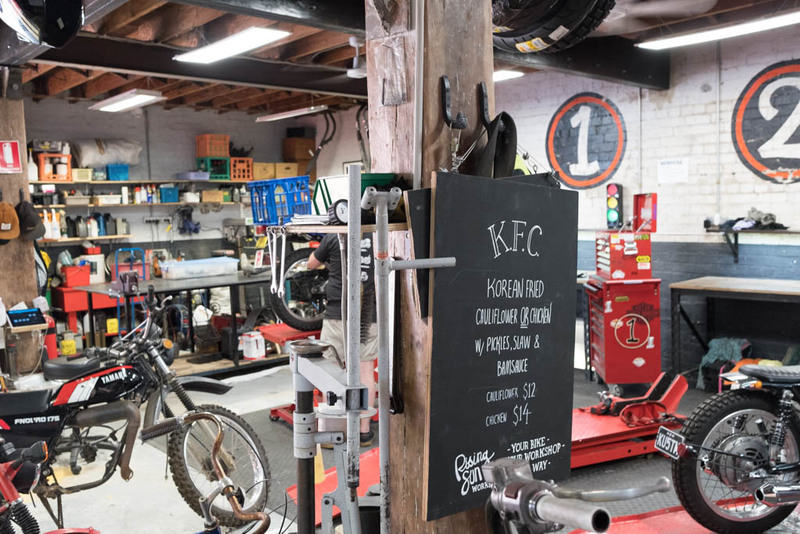 As a motorcycle rider, I would be here on a regular basis, learning more about what makes my ride work. 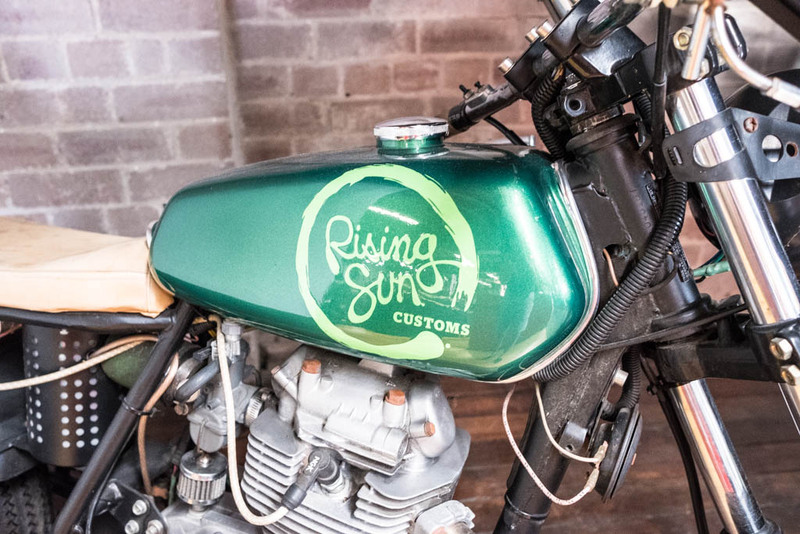 Maybe I'd finally buy that Honda Cub project bike I've been dreaming of. 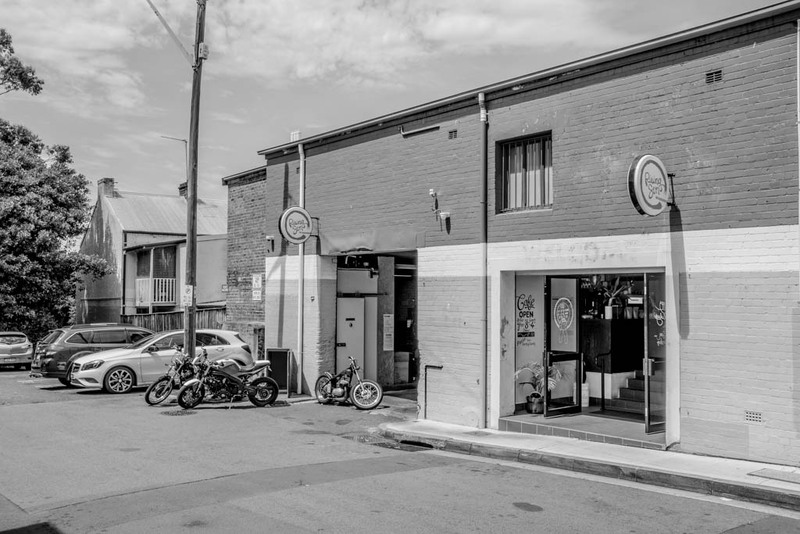 And the attached cafe, serving Australia-level coffee drinks is a nice bonus. 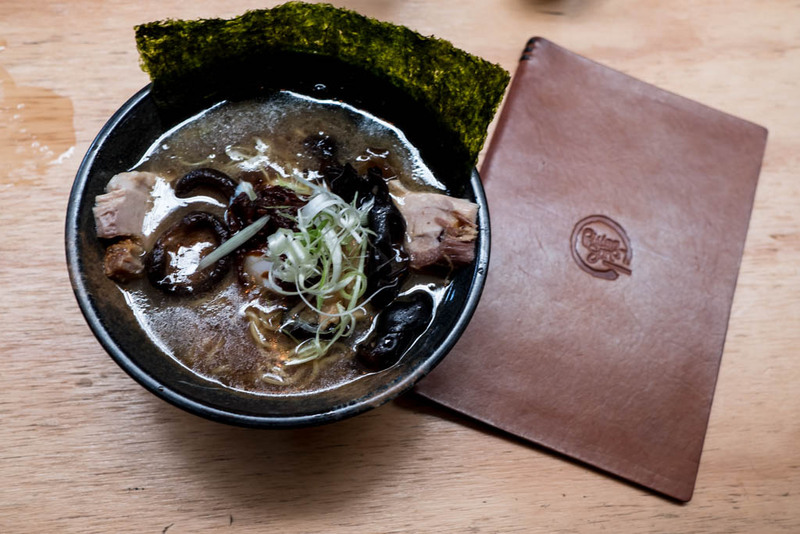 Oh, and they serve ramen. 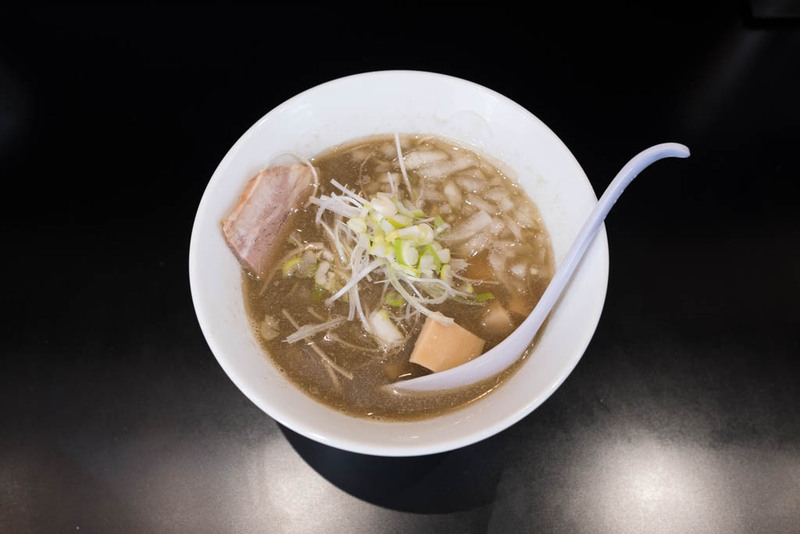 The first visit here was to try their breakfast ramen, served from eight in the morning until noon. A light bone broth is mixed with butter (surprisingly, it tasted like buttered toast), and topped with bacon and egg. It lacked any big soy or salt impact, letting the bacon stand out. As you eat, flavors mix and the whole thing turns into an unconventional umami bomb (thank you tomato). I was sold. As the morning ramen is the only ramen served before noon, I planned to make a trek back here to try their lunchtime bowl. 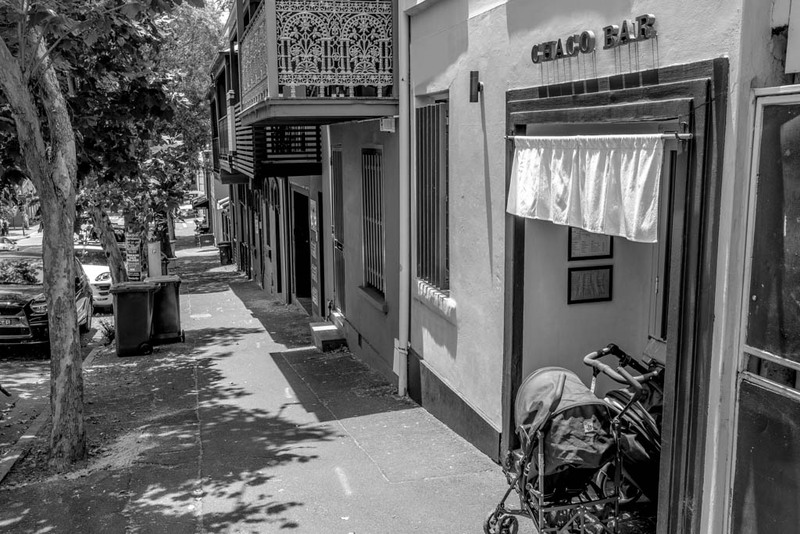 A quick trip out to Melbourne, and I was back in Sydney, ready for the next bowl. Lunch has three bowls; shoyu, shio, and vegetarian miso. Gotta go shoyu. 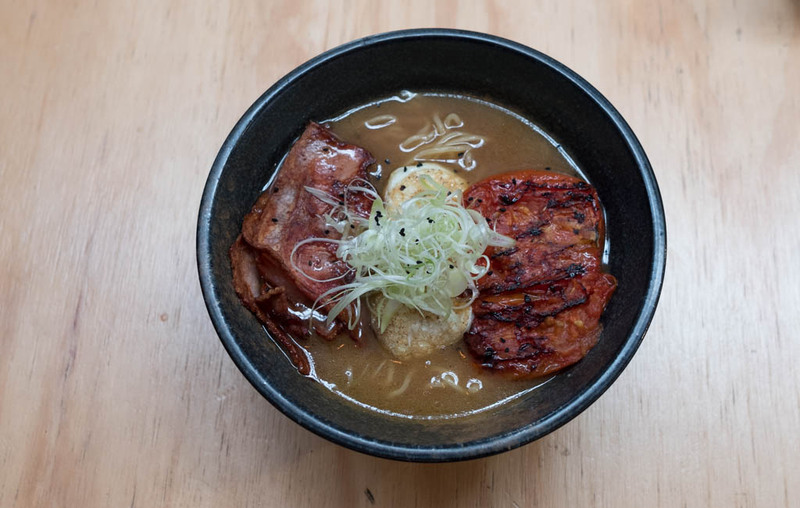 Bannockburn chickens, organic pork bones, shiitake, and smoked hocks go into the soup, while a standard shoyu tare provides the seasoning. 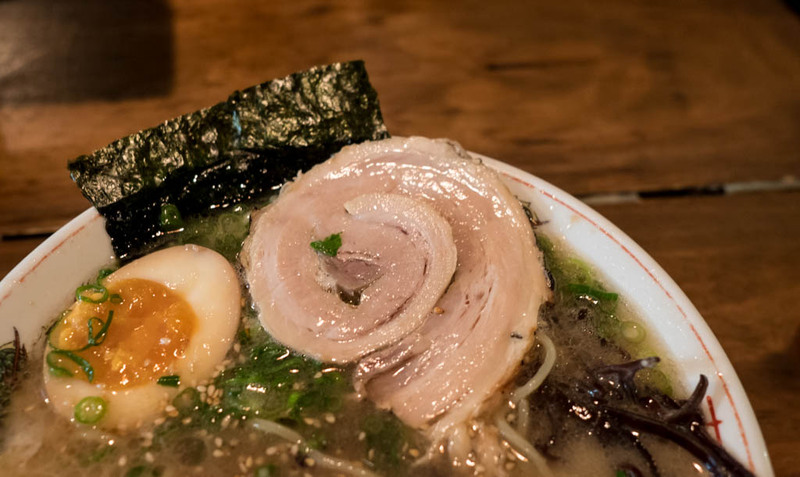 For a group of guys with no training in the ramen world, to create a bowl like this is a great feat. It's completely their own, with some very intense toppings. The slab of Berkshire pork chashu is massive and tender, and the "pickeld shits" are intense. 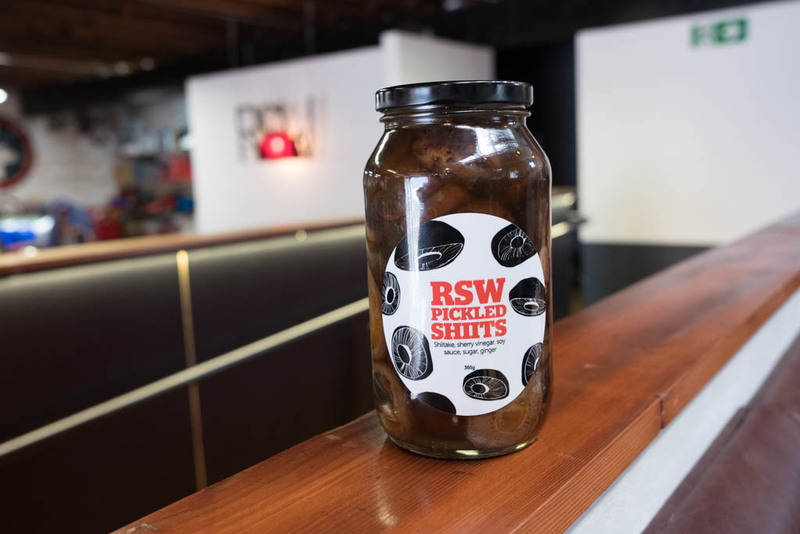 Shiitake mushroom pickled in vinegar, soy, and ginger. 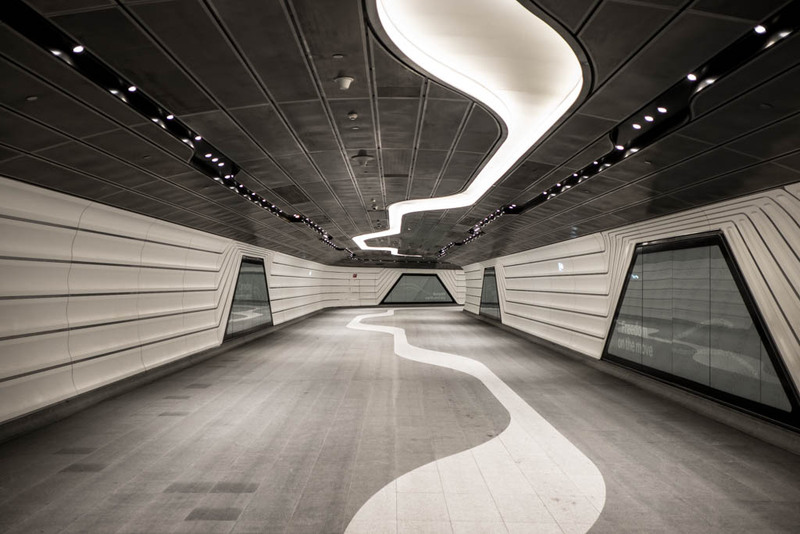 Please, someone, make something like this in Tokyo. Hey, I made a YouTube video about this one. I had a very, very small inkling to check out Tama, the cat. 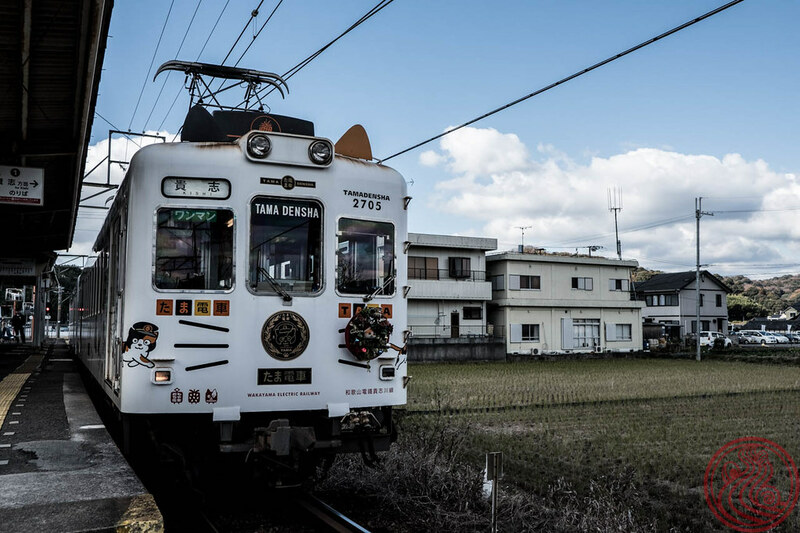 The short story is that in order to save a dying train line, the terminal station promoted a local stray cat to stationmaster. They put a funny hat on him and tourists flocked. They redesigned the train after this feline, and now the train nerds had something to go for. Like I said, my interest was there, but not enough to warrant a trip. 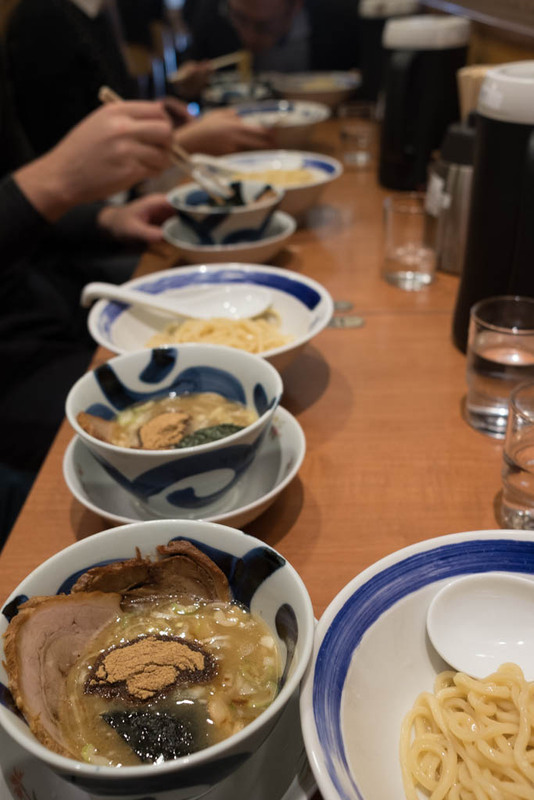 Well, someone recommended Shimasho, a ramen shop along said train line. 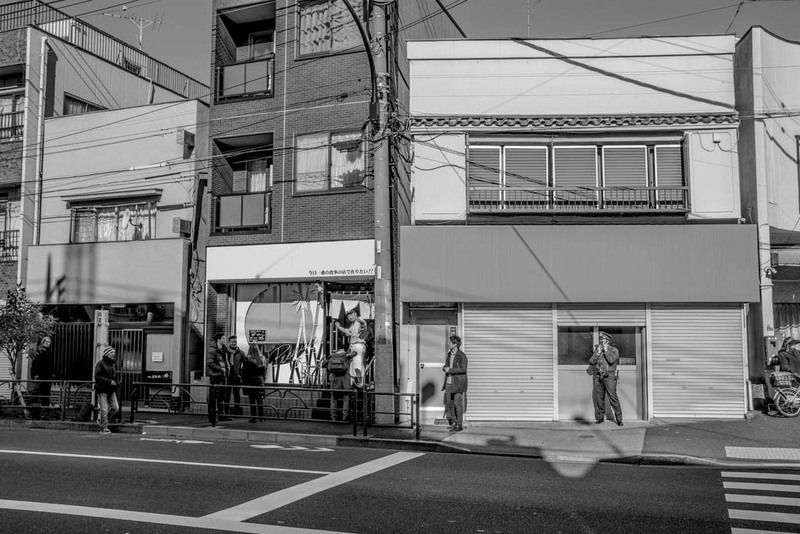 Shimasho is slightly lighter than the other shops in Wakayama I visited, but not by much. On a scale of one to Seino, I'd give this one a seven on the viscosity scale. Roadtrip worthy, but don't plan an entire vacation around it (save that for Seino). Oh, and Tama the cat? It was his day off when I went.